Now that I’ve shared my recommendations for creating an eco-friendly garden and a resilient garden during the past couple of weeks, I want to talk about how to have and care for a healthy lawn. I know, to many organic gardeners, “lawn” is a dirty word. 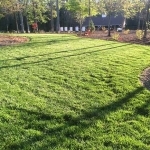 Incorporating lawn space is often viewed as environmentally irresponsible, but I’m here to tell you that it’s possible for turf grass to be a low maintenance asset in the landscape. Even if you don’t have (or want) a lawn, many of these principles can be just as applicable to other landscape areas. So, stick with me. You might be surprised to learn that I owe my television career to my expertise in lawn care. Back in the day, my horticultural forte’ was turf management, and I became recognized in the Atlanta area for my success. Before making my television debut, I was known in the Atlanta area for my expertise in healthy lawn care. In 2002, I was sought out by the editor of a new gardening magazine. She asked if I would be interested in writing a regular lawn care column. I welcomed the opportunity, but before I had a chance to write my first article, the editor reached out to me again. She had heard that there was a new garden show looking for a host. Although she barely knew me, she felt that I matched the description of the type of host they were looking for. She encouraged me to pursue the opportunity. I did, and the rest is history. I went on to become the host of that new DIY Network series, Fresh from the Garden, for three seasons. Ultimately, that (plus lots of hard work and a passion for gardening organically and sustainably) let me to where I am today. 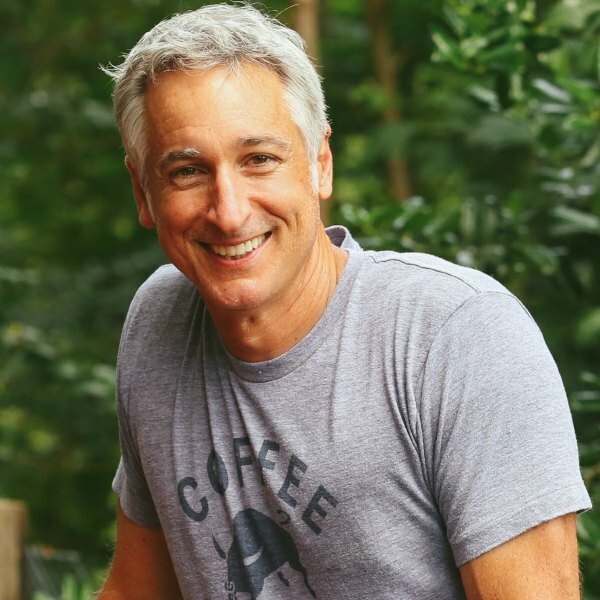 The truth is, before my Fresh from the Garden days, I used to be the guy who used all the traditional treatments as I strove for “the perfect lawn.” It was a fertilizer accident that led me to my organic epiphany. One day, I headed out to the yard with a broadcast spreader filled with 50 pounds of fertilizer. The spreader hit a tree root and spilled the entire contents onto the grass. I cleaned up the mess and didn’t think much more of it – but the next day, I discovered that entire area of lawn was dead. Although I’d removed as much of the fertilizer as possible, the trace remaining had still been too much. The overdose of nutrients burned up the grass, and it took weeks for it to recover. That was the day I began to realize the harm that synthetic chemicals can do in our landscape. I began to dig deeper and learned of more unintended consequences. 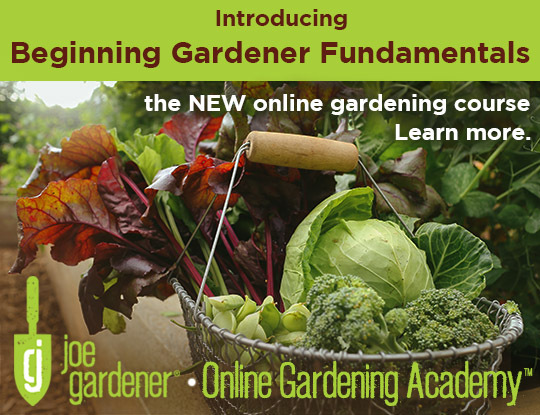 Pretty quickly, I had changed my entire approach to gardening and committed to organic methods. In spite of this switch, the lawns I maintained continued to thrive under my care. Organic lawn care can be challenging, but by sticking with some fundamentals, your organic lawn can be the most beautiful in the neighborhood. Is it wrong to have lawn? I don’t believe so. Yes, lawns can be water and other resource hogs, but they don’t have to be. There’s no denying that lawns are a monoculture and, when kept short, offer no ecological benefit. 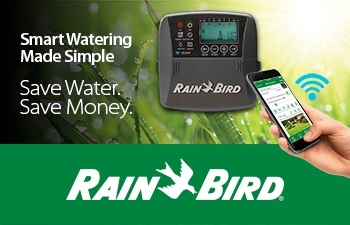 They can also be expensive to maintain – not just the water bill but also fertilizers, mowers, weed wackers, and the fuel some of those tools require. All that said, I have lawn at the GardenFarm™. Over an acre of my 5 acre property is lawn, actually. The remainder of my property is horse pasture, trees and shrubs, native plants and – of course – my 16 raised beds of the garden. I utilize lawn at the GardenFarm to create balance and a flow amongst landscape beds. I don’t feel that lawn needs to be the enemy. I incorporate it as a throughway between landscape beds. It connects and provides continuity to the landscape and provides a visual rest. It’s an aesthetically-pleasing feature, and it’s not bad for walking on either. If you ask me, having some lawn provides a nice balance to complement landscape beds. With the organic methods that I use, I’m able to be very “hands off” with my lawn. Because I focus on the health of the soil under my turf, I rarely need to water, and I never apply any synthetic treatments – ever. Yet this low maintenance lawn of mine is one of the best looking in the neighborhood. Yours can be too. Let’s dive into the lawn management topics important to understand. When you give these your attention, your lawn will look the best it can be. Just as it’s important to start by putting the right plant in the right place, the same is true of grass. Think of your lawn as millions of small plants and apply the same principles for plant health. When you provide the proper conditions, your grass will be more apt to thrive with little maintenance. Plenty of Sun Although some types of grasses are more tolerant of a bit of shade, most grasses require full sun for at least a few hours each day. If your lawn does fall into some shade, be sure to look for one of those shade tolerant varieties. 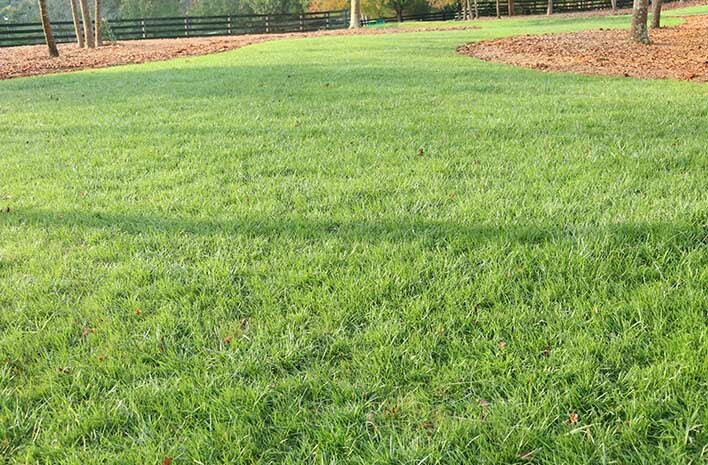 Selecting the proper type of grass for your conditions is so important to ongoing lawn health. 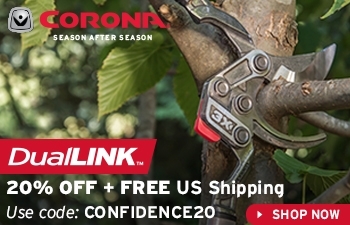 If your lawn is beginning to look a little worse for wear, look up. You may find that the canopy of surrounding trees has begun to encroach over the area. It happens so gradually, we often don’t notice until the lawn begins to suffer. My lawn is surrounded by lots of trees. I trim the lower branches each year to raise the leaf canopy and allow more light to reach the ground. Shade may not be the only problem. Nearby trees absorb water and nutrients more quickly than grass. 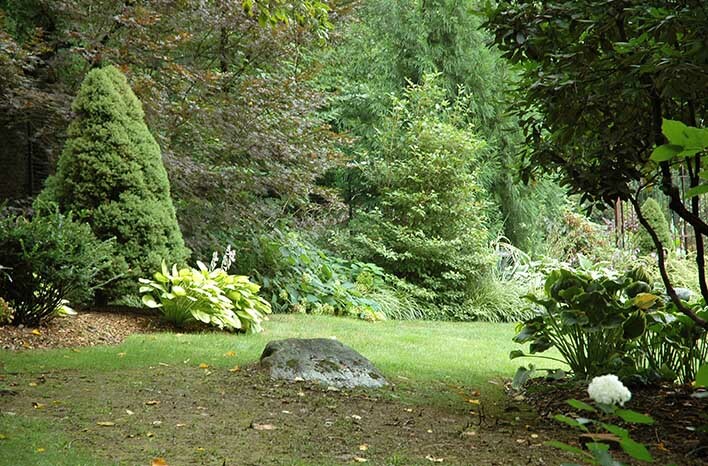 Should you add fertilizer or water to restore a failing area of lawn surrounded by trees? Not necessarily. The point is to understand all the issues that might be causing the distress, so you can determine the proper correction steps – rather than making the wrong assumption. If an area of your lawn begins to look thin and unhealthy, it may be that neighboring tree branches are shading out the area. Proper pH and Nutrient Balance Performing a soil test is one of the best steps you can take for a healthy lawn. Most turf grasses require a soil pH between 6.5 & 7.0 to be able to take up the nutrients needed for optimal vigor. A soil test will tell you exactly what you need to add to your soil to bring it within that ideal pH range, and the test is inexpensive and easy to do. Contact your local county extension service to obtain a test kit and allow 2-3 weeks for results. 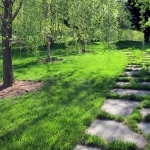 Access to Water Lawn, like other plantlife and trees, only need up to one inch of water each week. 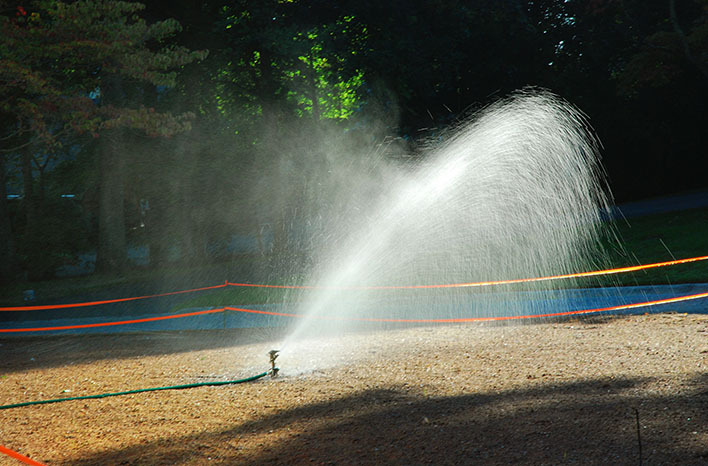 When your lawn doesn’t receive rain, you need to provide that water through irrigation. Or do you? I haven’t irrigated my lawn once this year, and there have been many weeks of zero rain. I’ve learned, though, that my lawn is healthy enough to maintain without supplemental irrigation – for a very long time. 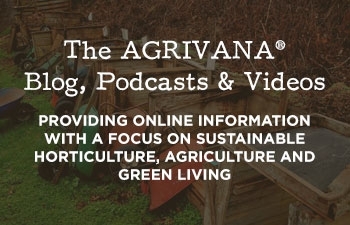 More on irrigation in a moment – and more on why I can get away without irrigating much at all. 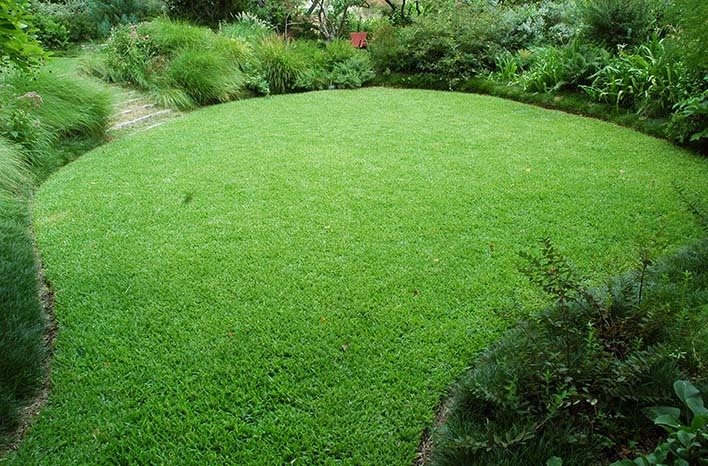 Healthy Soil Base Just as with any plant, your lawn requires healthy soil in order to thrive. The healthy soil base under my turf grass is the primary reason my lawn requires very little of my time and attention. You can improve any turf soil structure by using a core aerator. The aerator extracts plugs of turf roots. The space created provides areas for nutrients and water to soak more deeply into the soil surface and for grass roots to expand. The plugs look a little mess for a few days, but then they break down and provide nutrients back into your lawn. Aerating your lawn won’t transform your soil overnight. It’s a process. Improving the hard, red clay of my Atlanta-area soil has been an ongoing process for sure, but this once a year effort is worth it. Over time, it creates the healthy soil surface that will keep your lawn as low maintenance and lush as mine. It’s important that you don’t just water your lawn. You need to water your lawn properly to keep it resilient and looking great. One of the biggest and most common mistakes in lawn care is overwatering. Too much water will cause your lawn to die or, at best, cause problems to occur. As I just mentioned, your lawn needs no more than an inch of water each week. If you are irrigating, you can use a tuna can to test how long it takes to deliver an inch. Place empty tuna cans in the areas receiving water. Once there is an inch of water in the cans, there is an inch of water in your lawn too. The early, pre-dawn hours of the morning are the best time to water your existing or newly-seeded lawn. You’ll lose less of the water to evaporation, and the grass will dry off quickly as the sun comes up. You can provide all that water on one day, or you can provide half that amount twice a week. What you don’t want to do is provide just a little bit of water every day. Why? Brief watering means water doesn’t have the opportunity to soak deeply into the soil. Shallow water availability keeps roots shallow too. When roots remain near the soil surface, they are more prone to dry up and potentially die during hot days when the sun warms the ground. Instead, you want to water deeply and infrequently to encourage roots to grow deeper to access that water. Deep roots remain cooler and create a more drought tolerant lawn. When you water is important. 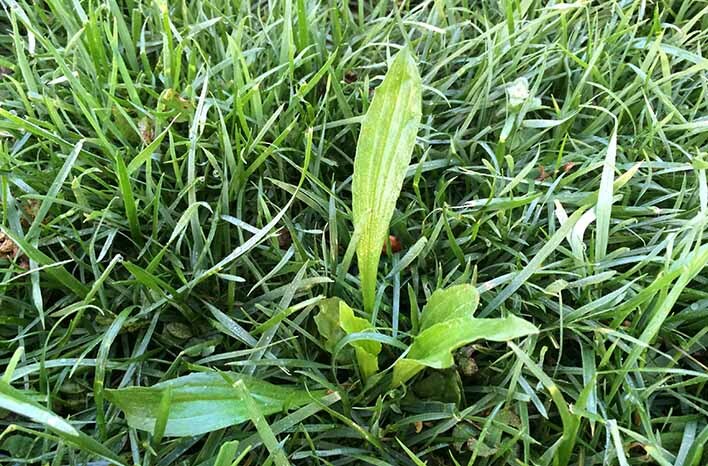 Wet grass blades are more susceptible to disease. When you water at night your grass remains wet for hours, and you are much more likely to encounter a disease problem. The best time to water is in the early morning hours (during the dew period), so as the sun comes up, the grass dries off quickly. All lawn grasses prefer a different height. Do a little research to learn yours, then cut high – never mowing lower than the top range of that preferred height. Those higher shoots will mean deeper roots. Your lawn will be more resilient, and it will have fewer weeds. Dense, tall grass outcompetes germinating weeds. Never remove more than a third of the overall height of the grass either. Cutting off more creates plant stress – which will affect the overall health and appearance of your lawn. When was the last time you sharpened the blade of your mower? A dull blade doesn’t cut the grass. It tears the grass. It leaves a rough edge and exposes more plant cells to disease. How often you should sharpen your blade depends on how often and how much area you mow. If you don’t see a clean slice on grass foliage, it’s time to sharpen. Finally, always alternate your mowing direction. Although you may prefer one direction or the other, sticking with the same routine can cause rutting which degrades the soil surface. Mix it up. If you mow from north to south one week, mow from east to west the following. Your lawn will reward you for it. 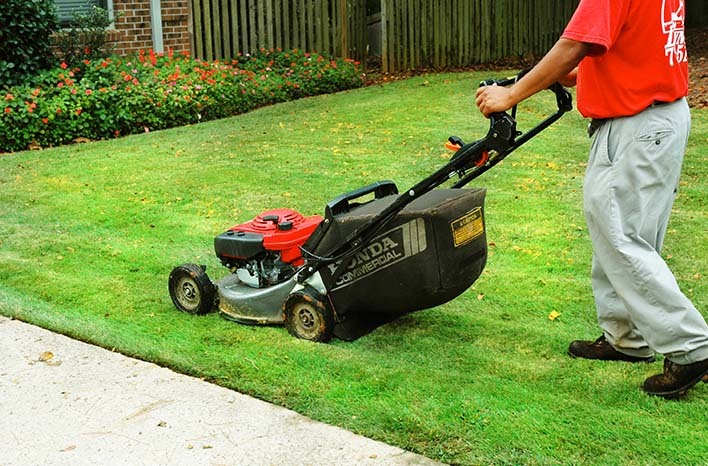 Learn the height range your lawn grass prefers – then mow high. For example, bluegrass and fescue prefer a height of 2″ to 3″ – so mowing to a height of 3″ will promote better lawn health while shading out competing weeds. Some types of lawn grasses are “light feeders” and will decline in health with too much fertilizer. Centipede is a great example. It’s a warm season grass known for being low maintenance; but if provided the same amount of nitrogen as bluegrass, for example, Centipede would begin to suffer. So as you prepare your soil test, be sure to indicate the type of grass you are growing when you submit the soil sample. This will help the lab to correctly identify where nutrient levels should fall in your soil and dial in what (if anything) you need to add to get there. When it comes to fertilizer, a little goes a long way. That is particularly true of synthetic fertilizer. Synthetic nutrients are released and taken up by plant roots quickly. Fertilizer burn occurs when there is too much nutrient in the soil that plants take up without self-regulating. Organic fertilizers, on the other hand, work in concert with the microorganisms of the soil food web, so they aren’t taken up as quickly by plants. Less burn risk. Twice a year, I apply a non-burning, organic-based fertilizer. 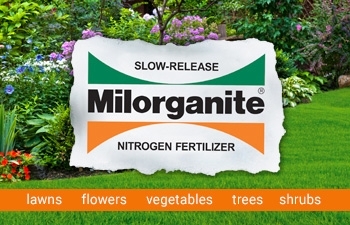 My product of choice is Milorganite®. It’s the only fertilizer I’ve used to keep my lawn lush and green for several years, and it doesn’t harm anything living in or beneath it. I also top-dress my entire lawn with a half-inch deep layer of compost or aged horse manure. I add these amendments right after I’ve aerated, so that the amendment falls into the spaces created from the aeration. I offer two cautions when it comes to compost and aged manure. One: If you buy compost, know what you’re buying. Quality is key. 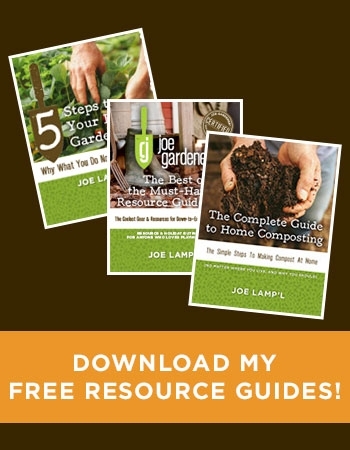 I covered some tips for purchasing compost in my raised bed podcast this spring. Two: Aged manure needs to be very well aged and composted. As animals graze, they are eating seeds which pass through in their manure. If the compost doesn’t get hot enough to kill them, those weed seeds will germinate in your lawn by the thousands. Anytime you opt to compost manure yourself, use a compost thermometer to monitor the temperature of the pile and make sure the core temperature remains over 150 degrees for at least 10 days. If you opt to purchase and apply a synthetic fertilizer, your options will display three numbers on the packaging. Check out the basics on those numbers in my The Numbers on Fertilizer Labels blog post. A once or twice per year amendment of compost or well-aged manure helps to promote a healthier soil base and a more vibrant lawn. In short as it relates to lawn care, the first number represents Nitrogen, and the second number represents Phosphorus. Typical lawn fertilizers include a high first number, but they sometimes include a higher middle number as well. 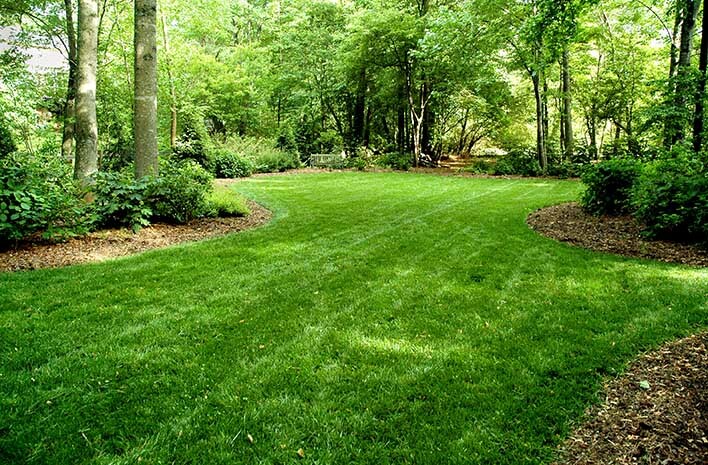 In other words, some lawn fertilizers include a high level of phosphorus. In general, you should avoid high phosphorus lawn fertilizers. Most native soils have plenty of phosphorus and adding too much – creating an excess – can have detrimental effects. An excess of synthetic nutrient is also the primary cause of nutrients which leach into our waterways. Synthetic nutrients not taken up by the plant roots won’t remain in the soil – they will wash away and contribute to the pollution our streams, lakes and oceans. You can cut down on fertilizer by 30% just by grass cycling. A mulching mower cuts the clippings into tiny bits of material and leaves them on the lawn to recycle back into the surface. They are so small that they break down quickly and are a great source of nitrogen. If you opt not to grass cycle, be sure to bag those clippings up to use in your compost or as an excellent nitrogen source. Grass clippings are too valuable to allow them to go to waste. As an organic gardener, weed control in my lawn is one of my biggest challenges. There just aren’t many great non-synthetic products available. Since I put so much focus on the proactive measures which promote grass health, I don’t have a big weed problem – the dense, healthy grass outcompetes the weeds. That can take time, and many of you are probably battling a weed problem. There are two types of weed management products: pre-emergent and post-emergent. These products are applied to the lawn surface to prevent weeds from germinating. Timing is key with pre-emergents, since you need to get it onto the surface before any weeds come up in spring. The best time to apply – depending on where you live – can be fall, very early spring or even in winter. The packaging will indicate the soil temperature you should look for to tell you when it’s time to apply – and check your local weather resource to find out the soil temperature in your area. Corn gluten is an organic pre-emergent. It can provide relatively good results over time, but don’t expect great things from your first application. It takes about three years of regular application for corn gluten to reach maximum efficiency. There are some tricks to proper application too. Check out my podcast with Lynda Chalker-Scott. Your weather can cause corn gluten to exacerbate rather than solve your weed problems. 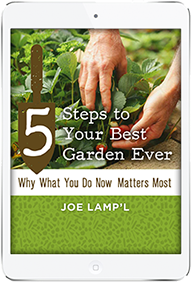 Controlling weeds in the lawn can be challenging for organic gardeners. My best weed management success comes from mowing high and the proactive steps I take to promote overall lawn health. Most synthetic weed control products are post-emergent – they kill the young or mature weed. If you choose a synthetic option, read the package instructions. Don’t make the mistake I once did many years ago. I didn’t read the package, so when I applied the product to my lawn, it killed the grass too. I knew that synthetic pre-emergents are not universally safe for all types of grass, but I was in a rush and didn’t pay attention. The post-emergent packaging will tell you what you should use. Household vinegar is one organic post-emergent option, but be careful. It’s non-selective – it will kill, or at least burn, everything it comes in contact with. Grass will recover from vinegar burn, but small creatures who live in lawns won’t. Vinegar is deadly to frogs and lizards, for example. Clove, thyme or citric oil are all organic post-emergents. They aren’t as potent as vinegar, so it may require repeated applications of the oil to effectively kill the weed. Chelated iron is a promising treatment, but it hasn’t been fully researched. This iron spray concentrate is a selective broadleaf treatment. The weed roots take up the iron more quickly than the roots of your turf grasses. The weeds die within hours, but your lawn is rarely affected. And even when it is, it will recover quickly. Do a little more research on your own before deciding if this treatment might be right for you. When disease rears its ugly head in the lawn, it’s usually a result of some sort of improper care. Disease can be the result of excess nitrogen application or applying nitrogen too late in the growing season for the plants to utilize properly. Overseeding or failing to aerate can result in disease, because both overcrowd the turf roots and create a lack of circulation. Overwatering or watering too late in the day will keep your grass wet for too long and provide an opportunity for fungus to develop. There are plenty of synthetic fungal controls available on the market but few organic options for lawn treatment. 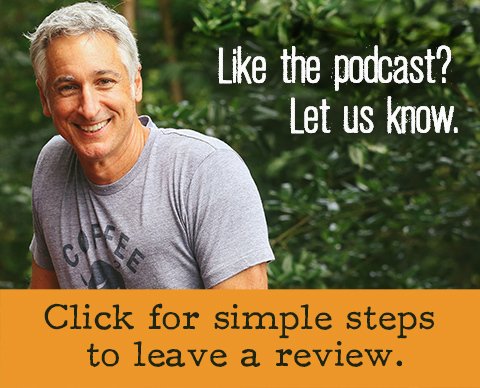 I have yet to find an organic product that I can recommend with much confidence, so if you have had success with an organic treatment, I would love to hear about your experience in the Comments section below. In spite of your best efforts, your lawn might begin to look a little worn. That might be a seasonal issue. Fescue and bluegrass are both cool-season grasses. They prefer the milder temperatures of spring and fall, so they can decline a bit during the hot summer stretch. The reverse is true of warm season grasses like zoysia as they go into dormancy. You may just need to wait things out to see if your lawn recovers as the weather turns. If the decline continues, go back to the fundamentals listed here and renovate your lawn. Try aerating the area and applying seed and organic materials. 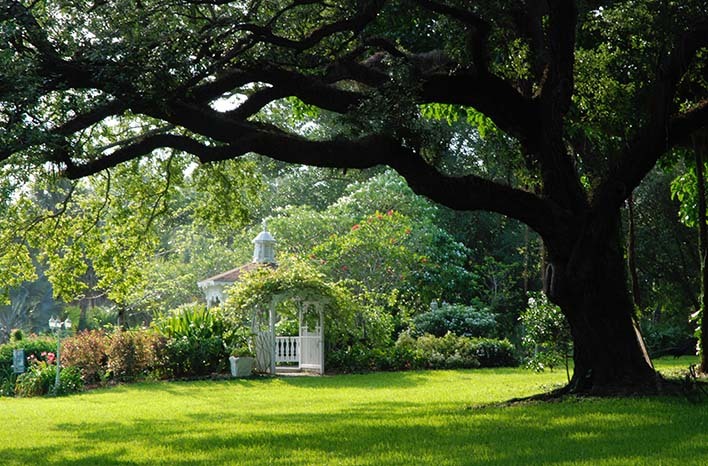 Prune shade trees to let in more light. 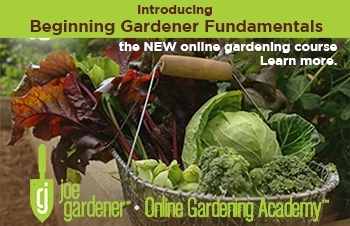 Take a fresh look at your watering habits and make adjustments. Lawn decline may be seasonal or it may be that conditions aren’t good for turfgrass. 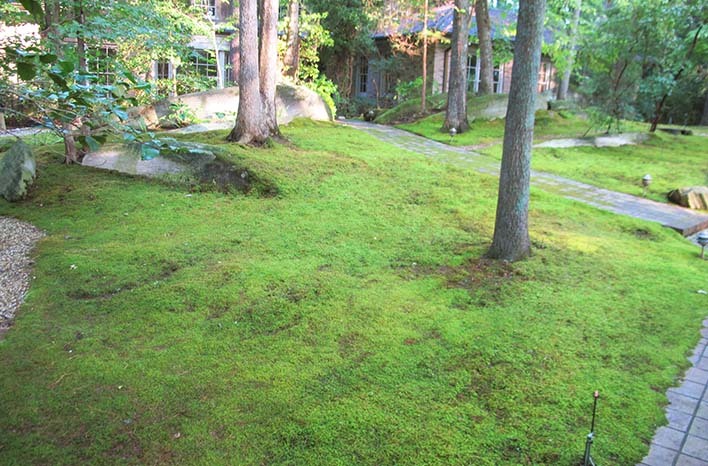 This shady area is perfect for this moss lawn. Your lawn may need to be replaced altogether if 50% or more of the area is dead, dying or infested with weeds. If replacement looks necessary, consider a grass alternative. Maybe the conditions where you’re trying to grow a lawn are better suited to an alternative like moss. Moss loves shade, compacted soil and a low soil pH, so if your landscape offers those conditions, it may be best to work with your environment rather than against it. Moss is beautiful and zero maintenance. 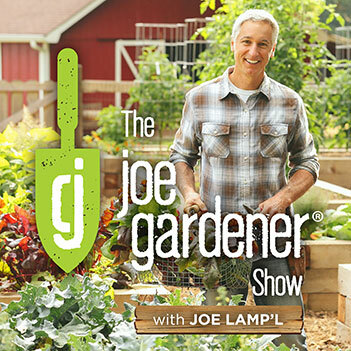 Check out an episode of my TV show, Growing a Greener World®, where we featured moss as a grass replacement. 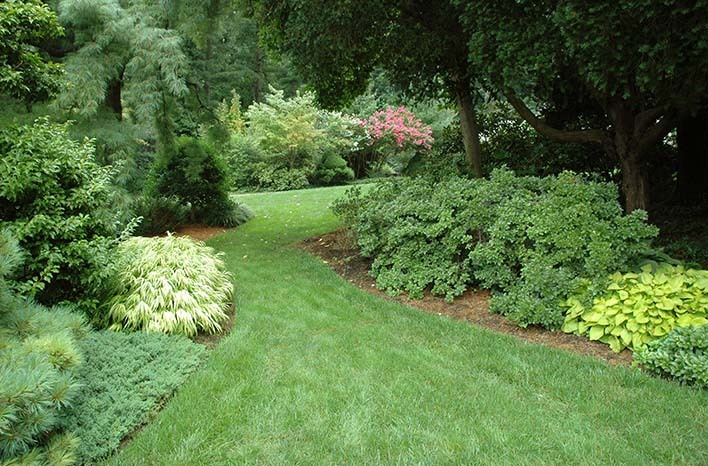 You might be better off replacing struggling lawn areas with mulch and landscape plants. For example, if grass isn’t growing well under trees in your landscape, pull out the lawn and mulch out to the shade boundary. My Atlanta-area property hasn’t seen significant rain this year, but I haven’t had to water my lawn even once. 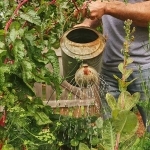 As I built up a healthy soil base and focused on soil and root health, I continued to push watering to the limits. I wouldn’t irrigate until the grass began to show signs of distress. I don’t recommend this approach for other plants, but it’s a good way to be as efficient as possible when watering grass. Over time, the roots of my turf were able to grow deeper and stronger – while the rich, healthy soil is able to retain moisture longer. For both these reasons, my lawn has developed a resiliency that allows it to sustain on its own – for the most part – without the supplemental watering my neighbors provide their grass. As you follow these fundamental principles and developing a healthier turf, I encourage you to occasionally put your lawn to the test. You will find that you can water less and less often too. Mastering these seven healthy lawn care topics will give you a low maintenance lawn that is the envy of your neighbors. Consider leaving part of your lawn unmowed. 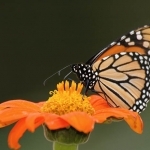 As the turfgrass grows, it creates a valuable habitat for birds, beneficial insects and other important creatures. The tall grass provides seed and shelter, and it can become a beautiful element in your landscape. You’ll be surprised at the wildlife which will be drawn to and thrive there. My friend and fellow podcaster, Margaret Roach, has done this in her property in upstate New York, and you can check it out on a season six episode of Growing a Greener World.